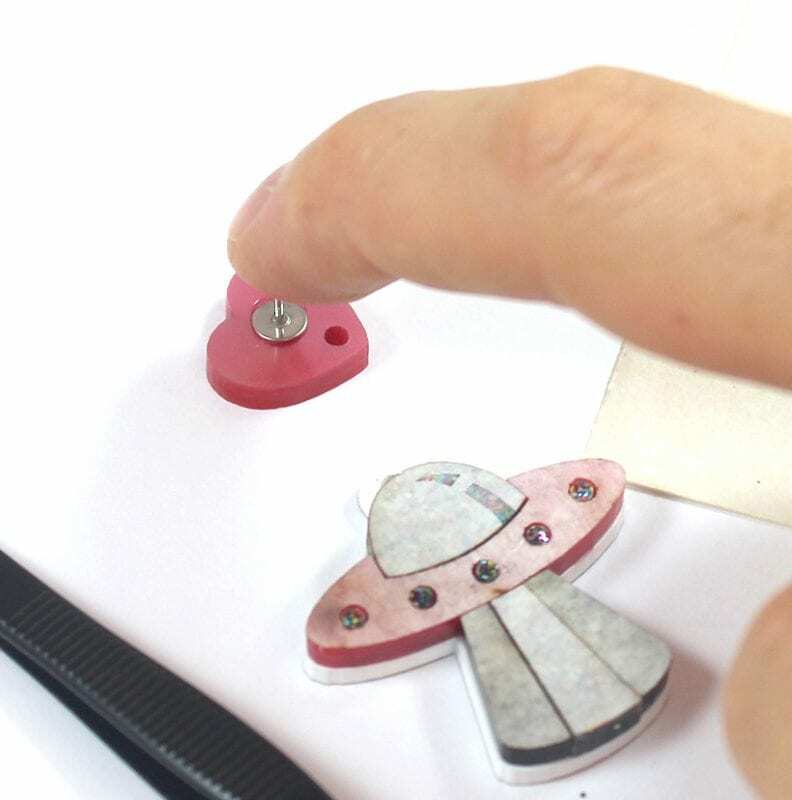 Hints and tips that we’ve learnt over the years for gluing metal components onto acrylic. Follow this tutorial for a long lasting product. 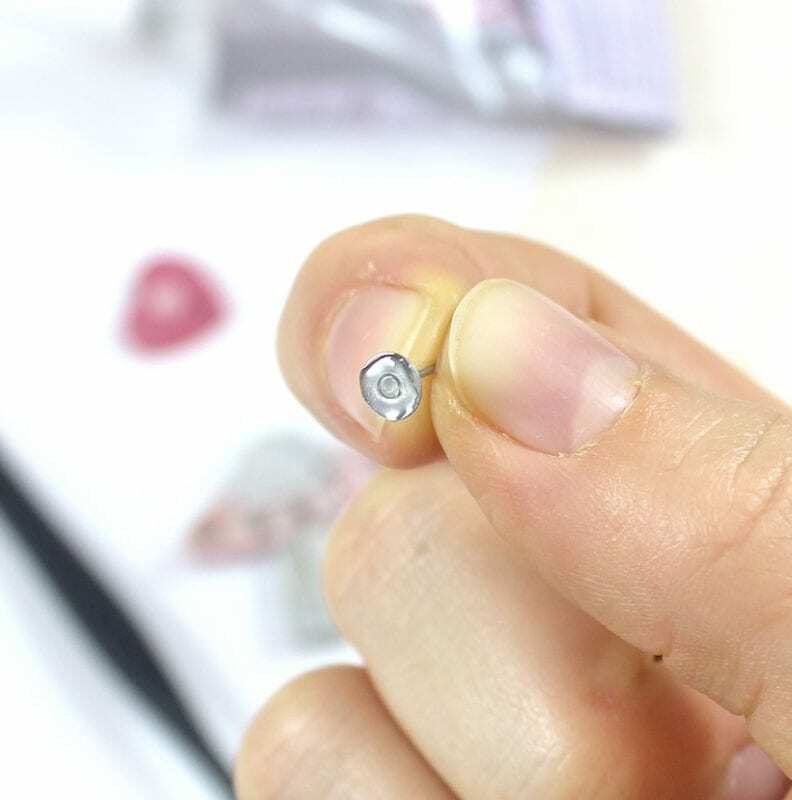 The same method can be applied to other end products, like brooches. A pack of Etched Charms Mini (tips for ordering included in Step 1) OR a pack of Mixed Bag of Paired Mini Circles (Pack of 40). Order a set of Etched Charms Mini. For the options, select ‘New Design’ and instead of uploading a design write in the comments box ‘Please etch a 3mm solid circle onto the back, positioned in the middle of shape 1D Sweetheart’. Note: You do not need etching on the back of your charms to glue onto them (only about 10% of our customers do this). However, in our experience, it is an investment that creates a longer lasting product. The etched area is rough and provides more surface area for the glue to adhere to. As an alternate option, order a pack of Mixed Bag of Paired Mini Circles (Pack of 40). Set yourself up in a well ventilated area. Squeeze out a small amount of glue onto your piece of card – about a toothpaste amount. E6000 tubes are metal, so squeeze from the bottom of the tube UP (so that over time you may roll the end, like in our photograph). You only need to apply a very small amount of pressure to the tube for the glue to come out, if it doesn’t flow freely out on its own already. 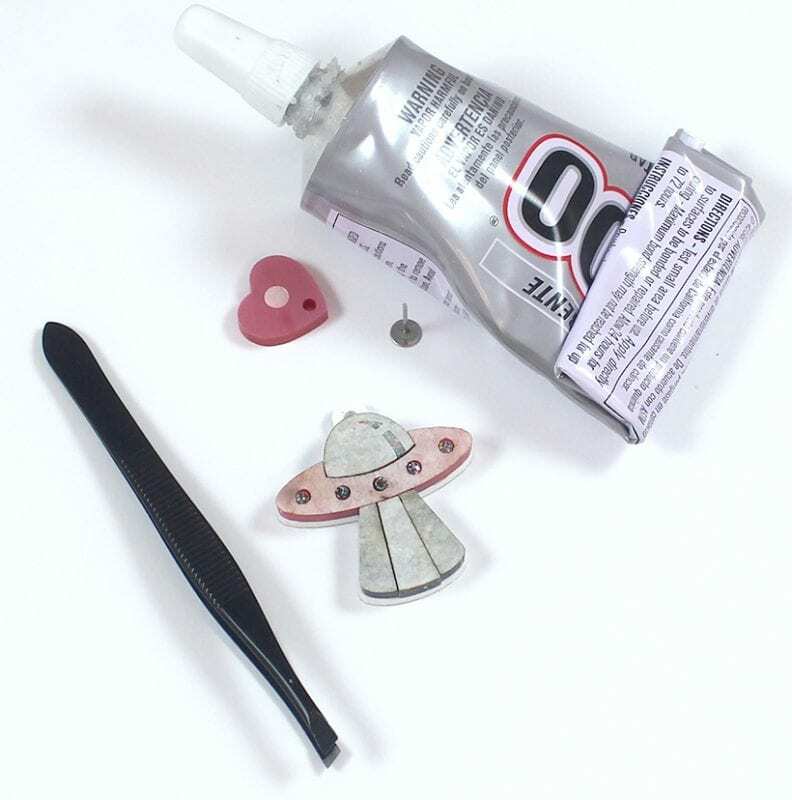 Pick up the earring post and dab it into your glue. You want to get a small amount that covers the total surface area. 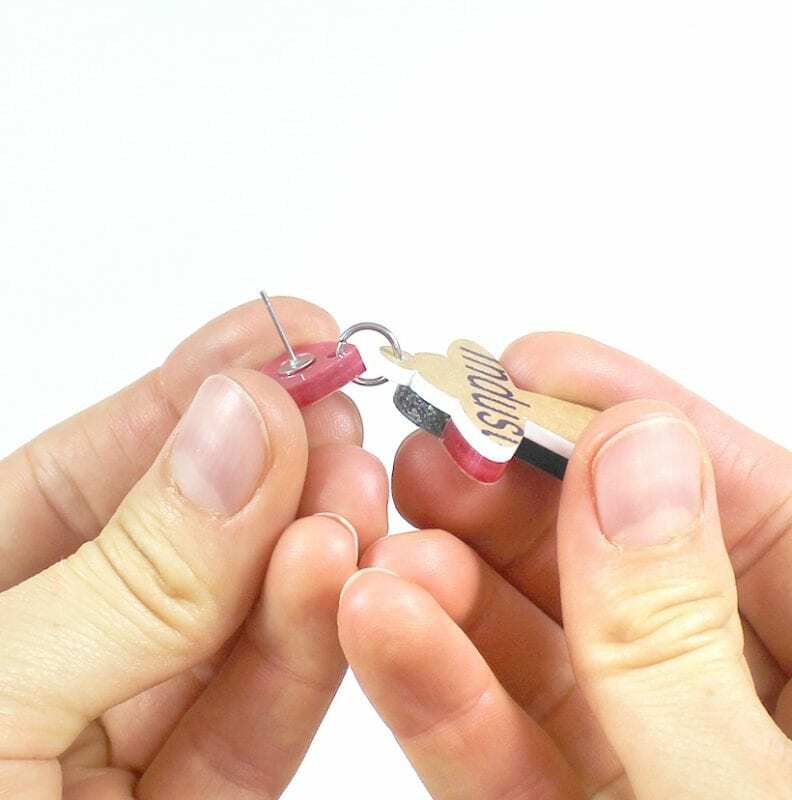 Gently navigate the earring post to where it needs to be. 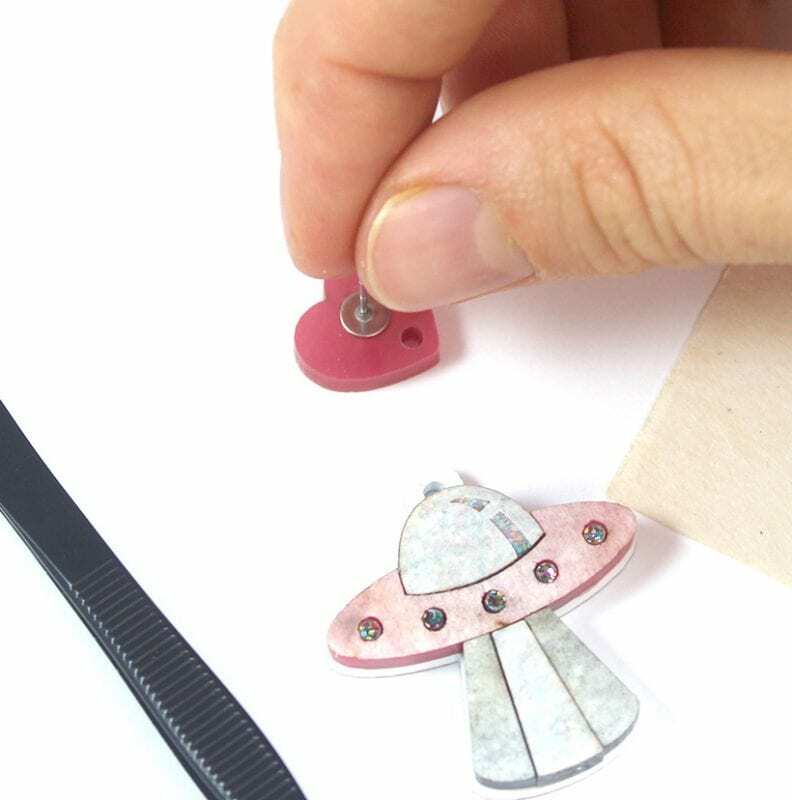 Try to get it as close to it’s final resting spot as possible, otherwise you will need to push it around and will create excess glue mess on the back of your charm. With the earring post in place, gently apply pressure to create a tight bond. Make sure to apply pressure evenly, otherwise you may accidentally push the post to the side. IMPORTANT: We’ve found that mirror acrylic will commonly show the glue area on the front of the material. We do not know how to stop this from happening completely, but it can be reduced by only applying the ear post with light pressure. Leave your pieces to glue. Try not to touch or move them around. Really, leave them be. E6000 will get tacky within about 2 minutes, and set in approximately 10 minutes. A full cure takes between 24 and 72 hours. 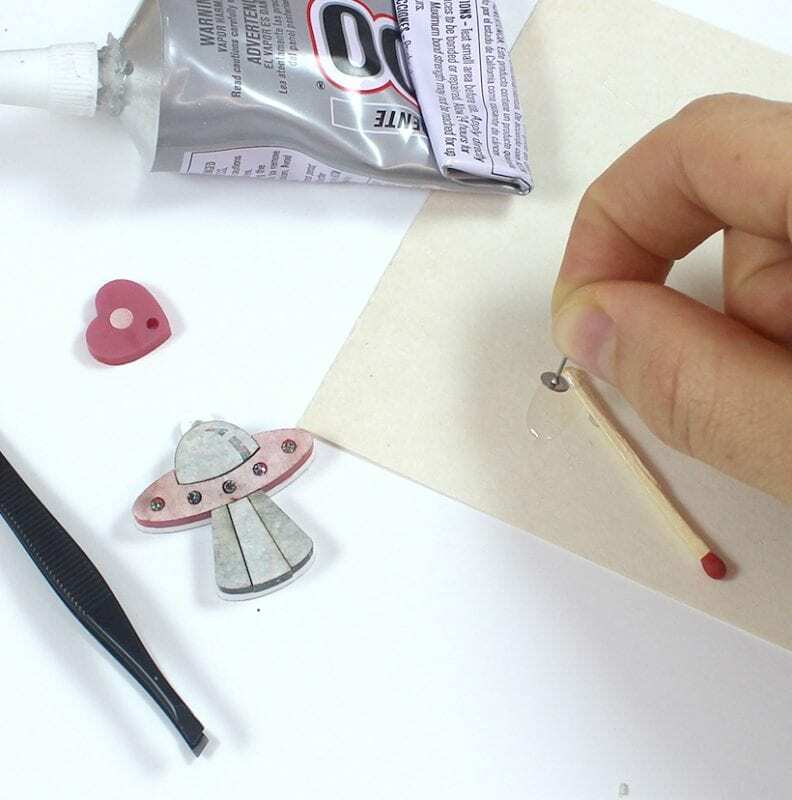 Keep the card with your left over glue with the pieces that you’ve just glued. You’ll be able to use it to check that the glue has cured. Things like temperature and humidity can affect dry time, so by keeping your left over glue swatch with the pieces that are curing, you’ll have a simple way to double check that everything is dry.